New York City doesn't skimp on holiday revelry, so whether you're in town for the big parade or sticking close to home for the turkey-centric feast this year, rest assured there's plenty to make your Thanksgiving in the city a memorable one. Enjoy Manhattan's thriving cultural scene and festive holiday spirit with one of these popular activities on Thanksgiving weekend. Thanksgiving is synonymous with the annual Macy's Thanksgiving Day Parade. It's one thing to watch the parade at home on TV, but the spectacle takes on an entirely new dimension when you view it in person. You'll thrill as vibrant floats, festive marching bands, dance troupes, celebrity guests, old St. Nick, and those massive helium balloons pass by. The parade typically kicks off at 9 a.m. from Central Park West and West 77th Street and follows a 2.5-mile path that traces Central Park around to 6th Avenue, before making its way down to 34th Street, site of Macy's flagship department store. Curbside viewing is first come, first served, so be prepared to show up hours early if you want a front-row spot. Can't get enough of those Thanksgiving Day Parade balloons? Get your fix of those helium-filled behemoths on Thanksgiving Eve, when the parade balloon inflation is held. It's as much of a beloved annual Thanksgiving tradition in NYC as the parade itself. During late afternoon and early evening on the day before the parade, visitors can sneak peek at the balloons taking shape on the Upper West Side near the parade's starting point around the grounds of the American Museum of Natural History. New York City never sleeps, and that includes Thanksgiving day. There will be a restaurant, a take-out place, or a grocery store open on Turkey Day. Certainly, you can cook, but you can also leave the cooking to the pros. Check out our some of the best Manhattan restaurants serving up Thanksgiving dinners. Or, if you prefer to enjoy the big meal at home, don't overlook the possibility of ordering in a catered Thanksgiving meal. These Manhattan grocery stores offer standout Thanksgiving to-go menus (including delivery). Shoppers will find no shortage of retail therapy options in NYC, and the “Black Friday” post-Thanksgiving sales can be downright jaw-dropping. Stores across the city compete to lure shoppers in with bargain-basement deals. If you're up for braving the masses (it's the single busiest shopping day of the year), you can score some major deals on “Black Friday” (though many deals run through the remainder of the weekend, too). Head to Radio City Music Hall where you can see 36 Rockettes in each performance of the Radio City Christmas Spectacular, one of New York City's most iconic Christmas events. Their precision dance moves and high kicks are truly impressive to experience in person. The show features a number of live animals, including camels, sheep, and donkeys featured in the “Living Nativity” scene at the end of the production. The animals, live in Radio City Music Hall with their handlers throughout the show's 9-week run, and sometimes they are spotted outside of Radio City getting exercise. Don't miss out on the true spirit of the season: give back. There are many rewarding volunteer opportunities in New York throughout the year, with a special need for helping hands in soup kitchens, homeless shelters, and families around the city for the Thanksgiving holiday. For ideas on current volunteer needs for Thanksgiving, the Thanksgiving volunteering opportunity referrals maintained by New York Cares will give you a head start in lending a helping hand. If stuffing yourself with turkey and watching TV doesn't fully satisfy your desire to do something special on your day off, there are New York attractions that open their doors...even on Thanksgiving Day. 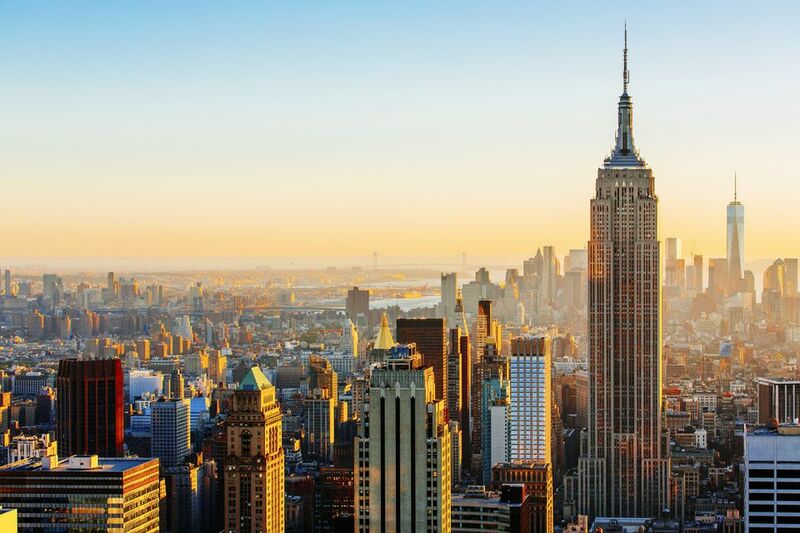 These include the city's three major observatories: Top of the Rock, Empire State Building, and One World Observatory; and bucket list sites like Statue of Liberty and Ellis Island. With kids in tow, Madame Tussaud's Wax Museum or Central Park Zoo might be just the ticket. If museums are more your speed, you can pop into a handful of institutions with Thanksgiving hours, like the 9/11 Memorial Museum or the National Museum of the American Indian. And, of course, don't overlook the open-air public space attractions that are free and open to the public year long, like Central Park, High Line, and Times Square. Just as Thanksgiving passes, Manhattan's Christmas spirit kicks into high gear. Christmas in New York City includes holiday light displays across the city, festive holiday shows, and more Christmas-themed fun that will be mostly up and running by the Thanksgiving weekend. Or, get a glimpse of the winter wonderland by taking to the ice on one of the city's ice-skating rinks, most of which are well underway by Thanksgiving weekend. Thanksgiving marks the arrival of many department store's impressive window displays...stores such as Macy's, Bloomingdale's, Saks, and Barneys go all out, creating elaborate, holiday-themed displays that delight adults and children alike. Most stores host a special event to mark the unveiling of the year's designs, and in recent years, there has been a greater amount of commercial support for the windows, with merchandise, books, and souvenirs available for sale at stores, reflecting the year's theme. If you want wild fun on Thanksgiving, several of the city's top zoos (Prospect Park Zoo, Queens Zoo, and Central Park Zoo) are open Thanksgiving Day. New York City has five zoos, one in each Borough. The Bronx Zoo is the largest, with 750 species from all over the world. The Central Park Zoo may not be big, but it's home to penguins, snow leopards, and other unique animals. If you want to escape the holiday hustle and bustle, you can catch a Metro-North train to Hudson Valley. With roadside farm stands, historic markers, scenic overlooks, and hiking trails dotting the photogenic landscape, New York State's pastoral Hudson Valley region promises a peaceful getaway from the city. Charming towns like Cold Spring and Tarrytown have plenty of small restaurants, boutiques, and more. Is April a Good Time to Visit NYC?